Background: ZnO microstructures decorated with Ag nanoparticles (AgZnO) were synthesized by sol-gel method. Methodology: The samples were annealed at different annealing temperature ranging from 500 to 700°C, respectively. Results: The effect of different annealing temperature on the crystal structure and morphologies of prepared samples were characterized by X-ray diffraction (XRD), field emission scanning electron microscope (FESEM) and energy dispersive X-ray spectrum (EDS). The photocatalytic degradation reaction is tested by the decomposition of methylene blue (MB) dye under ultra violet (UV) irradiation for 60 minutes. Conclusion: The EDS result demonstrated that the particle-like AgZnO samples consist of element Zn, O and Ag. XRD analysis shows that the AgZnO exhibited a hexagonal wurtzite crystal structure of ZnO and face-centered cubic (FCC) of Ag. The crystallite size was increased as annealing temperature was increased in the range of 84.14 nm – 103.89 nm. 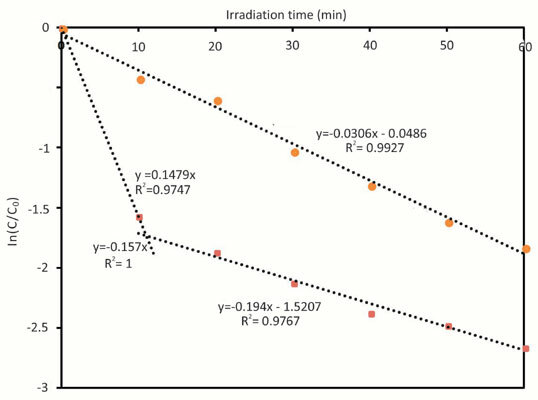 In particular, AgZnO annealed at 700°C exhibits the highest photocatalytic activity by degrading methylene blue (MB) solution by almost 92.99 % in 60 minutes compared to pure ZnO samples. ZnO microstructure, Ag nanoparticles, photocatalytic, annealing temperature, methylene blue, environmental pollution.